In what has become a daily see-saw pattern in global capital markets where the only variable is whether trade war sentiment du jour is better or worse, US futures have soared along with European and Asian shares after overnight China’s President Xi Jinping struck a "conciliatory tone" on trade during a major address, refusing to retaliate to Trump recent trade war escalation. As we noted last night, President Xi's speech at the Boao Forum outlined that the Chinese government intends to make a number of policy changes, including lower import tariffs for automobiles and other products, increase market access for foreign investors, strengthen protection of intellectual property rights, and create a more attractive investment environment for foreign investors. President Xi said implementation should be "as soon as possible" suggesting swifter implementation than before. More importantly, Xi used his speech to dial down tensions on trade, framing a package of measures to open China’s economy, according to Bloomberg's Tom Orlik. Still, while many of those steps are not entirely new, and the U.S. will likely want to see deeds, not just words, before it considers softening its protectionist stance, even so, with Xi’s speech positioning China as conciliatory, the chances of a damaging trade war appear somewhat lower. “China is not interested in a trade war for sure, but the U.S. is not bluffing either,” Hans Goetti, founder of HG Research, told Bloomberg. "The truth is that the U.S. wants to come out on top of this, but I do know at some point there would be negotiations." "Markets will welcome this rational, measured response from President Xi,” said Ben Kwong, executive director in Hong Kong at KGI Asia Ltd. “By emphasizing that China will seek cooperation with other countries to achieve a win-win solution, Xi is projecting himself as the gentleman here." China was cast as the grown-up in the trade debate; committed to multilateralism, reducing tariffs, and protecting intellectual property. The speech does not allow the Trump Twitter Feed to report "mission accomplished". If the US cannot spin a win, trade tensions are likely to continue. Also, just hours after Xi' speech, Bloomberg reported that trade talks between the US and China broke down last week after the Trump administration demanded that China curtail support for high-technology industries. The U.S. demands came after Beijing offered to narrow the trade deficit by $50 billion, including by importing more liquefied natural gas, agricultural products, semiconductors and luxury goods, according to the person. The plans also included opening the financial sector at a faster rate and giving U.S. companies more access to China’s booming e-commerce market, the person added. At the same time, China has begun dispute procedure challenging President Donald Trump’s steel and aluminum tariffs, according to filing with WTO in Geneva. And while the newsflow was decidedly mixed, algos remained stuck in euphoric "buy everything" mode thanks to Xi's speech, and this morning futures and global markets were a sea of green. ... As S&P futures rallied as much as 40 points on the Xi rally and traded near yesterday's highs. And even Chinese stocks closed at the highs. In short, for now the euphoria part of the bipolar market dominates. That will change, however, as soon as Trump starts tweeting and reminds the market that his personal lawyer is now a target of an FBI probe that seeks to turn Trump's most trusted confidant against him, and potentially result in a constitutional crisis should Trump decide to fire Mueller. Separately, as Citi notes, potential (geo)political risks continue to loom in the background. "The weather forecast continues to look cloudy as we await to hear Trump’s response to the latest developments in Syria and the Mueller investigation after the FBI raided the home of his personal lawyer. Additionally US/China trade relations will continue to play out over the foreseeable future." "Should you buy the dip?" Citi asks rhetorically? For now, the answer is yes: in addition to the surge in US futures, European equity markets positive across the board, led by mining sector. Leading sectors include industrials and consumer discretionary. Outperformance has come from individual stock moves in LVMH (+5.2%) with sales figures providing positive signals for the luxury sector, lifting Christian Dior (+3.7%) and Kering (+3.1%) in sympathy. The strength in the Stoxx Europe 600 Index followed shares from Sydney to Hong Kong higher alongside oil and metals. Australia's ASX 200 (+0.7%) and Nikkei 225 (+0.6%) were underpinned as markets reacted positively to President Xi’s bullish speech with Japan helped by a weaker currency and as automakers cheered the news of the reduced tariffs. China's ramping Shanghai Comp. (+1.7%) and Hang Seng (+1.7%) conformed to the optimism. In macro, the USD is marginally weaker against G-10, with a brief spike lower in USD/JPY after further reports of U.S/China talks having broken down. The pound advanced versus the dollar, touching a two- week high at 1.4179; Bank of England policy maker Ian McCafferty said in a Reuters interview that “we shouldn’t dally when it comes to tightening policy modestly.” The Norwegian krone slipped after inflation missed estimates in March. The Russian ruble tumbled a second day to the weakest level since December 2016 amid heightened geopolitical risks and U.S. sanctions. Focusing on specific currencies, RUB continues to feel the pain, down as much as 4% for the second day running. The currency has moved more in the last 48 hours than the whole range of 2017 and right now, it’s hard to call the bottom as investor sentiment sours. Amid four CPI prints overnight, NOK is looking especially cloudy after a downside surprise. Bund futures push higher in early trade due to large block trade, overall core fixed income still within a tight range. Crude futures and metals markets supported by generally positive environment. Material names have also been lifted as a result of the aforementioned improving risk sentiment positively affecting the sector due to their exposure to the tariff effects. Expected U.S. data include wholesale trade sales and PPI. The ECB's Nouy and Nowotny are both scheduled to speak. There was a clear effort by the ECB to signal economic strength yesterday. The Eurozone economy is likely to come off its recent highs this year as trend growth reasserts itself. Away from that, Facebook's Zuckerberg is due to testify before the combined Senate Judiciary and Commerce committee today following the investigation into the scandal around data protection. He will then face the House Energy and Commerce Committee tomorrow. President Donald Trump expressed optimism the U.S. will be able to reach a deal with China that diffuses trade tensions between the world’s two biggest economies. Asia stocks traded higher across the board as the region focused on Chinese President Xi Jinping’s address at the Boao Forum which struck a conciliatory tone as he stated that cold war mentality is out of place and that China will expand the opening up of its economy. Furthermore, President Xi also vowed to lower auto tariffs and repeated the suggestion of a win-win scenario. 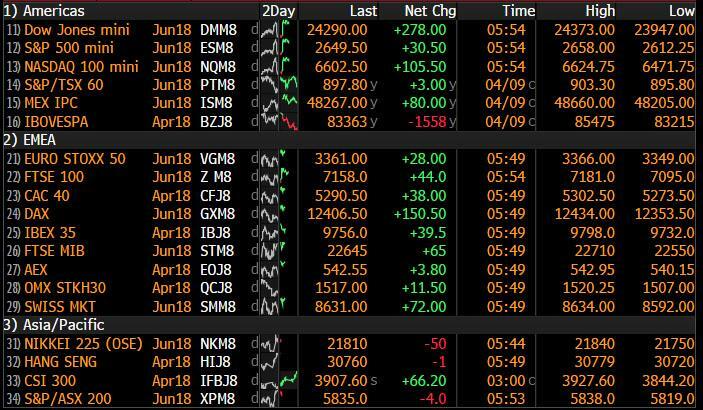 As such, ASX 200 (+0.7%) and Nikkei 225 (+0.6%) were underpinned as markets reacted positively to President Xi’s bullish speech with Japan helped by a weaker currency and as automakers cheered the news of the reduced tariffs. Elsewhere, Shanghai Comp. (+0.5%) and Hang Seng (+1.2%) conformed to the optimism, while US equity futures also recovered from the selling pressure seen from reports the FBI raided Trump lawyer Michael Cohen amid investigation related to possible bank fraud, campaign finance and the payment made to Stormy Daniels. In FX, the DXY looks top-heavy again having lost momentum after its latest flirtation with the 90.000 pivot, and a breakdown of the basket reveals a distinct revival of appetite for riskier currencies. AUD has reversed relative losses and more vs the USD and NZD in wake of conciliatory remarks from Chinese President Xi on import tariffs and wider economic reforms to leap ahead of its G10 counterparts and clear several major technical obstacles in the process. AUD/USD finally soaked up offers at the 0.7700 level, including option-related supply, and the 20 DMA at 0.7719 on the way to 0.7740, while the Kiwi has crossed 0.7300 vs the Greenback as AUD/NZD holds just below 1.0550. GBP has retained its recent bid tone with the aid of hawkish comments from BoE’s McCafferty and strong May MPC hike expectations, with Cable up above 1.4160 again and EUR/GBP retesting bids/support around 0.8700. CAD/EUR/CHF are all pretty flat vs the Dollar, but with the Loonie still underpinned by NAFTA deal hopes/anticipation and breaching some chart levels after the BoC’s upbeat business survey yesterday. USD/CAD has subsequently slipped down through a Fib at 1.2723, the 55 DMA at 1.2715 and 100 DMA at 1.2691 on its way to a circa 1.2675 low before consolidating. EUR/USD has settled above 1.2300, but appears capped by offers around 1.2330 and 1.2345 resistance, while USD/CHF resides just above 0.9550. JPY The stand-out, but not outsize loser given the broad improvement in risk sentiment, as USD/JPY continues to find 107.00 alluring ahead of hefty option expiry interest at the big figure this week, plus upside technical barriers from 107.10-15 (55 DMA) to 107.50-55 (Fib). No respite for RUB or Russian assets in general, as USD/RUB extends to the upside and peaks just shy of 64.000 at one stage. In commodities, WTI and Brent crude futures are both trading higher, in-fitting with the global risk picture and amid lingering geopolitical tensions. This comes after US President Trump yesterday condemned the reported chemical attack in Syria and stated that the US is to make a decision on next steps in 24-48 hours; Trump refused to rule out military action. Furthermore, traders will also be mindful of the recent comments from Iran yesterday who threatened a strong response if the US pulls out of the nuclear deal and reapplies sanctions. Upcoming focus for the energy sector will likely centre around any developments on this front and tonight’s API inventory release. In metals markets, spot gold is trading with little in the way of firm direction after Xi-inspired downside overnight has been pared back during European hours. Elsewhere, aluminium prices continue to be lifted by the fallout of Russian sanctions, whilst Chinese Dalian iron ore futures were seen higher during Asia-Pac hours amid the broader risk sentiment seen overnight. Looking at the day ahead, the early focus in Europe will likely be the February IP print in France. In the US the most significant release is the March PPI report, while other data due includes the March NFIB small business optimism reading and February wholesale inventories print. Away from that, Facebook's Zuckerberg is due to testify before the combined Senate Judiciary and Commerce committee today following the investigation into the scandal around data protection. He will then face the House Energy and Commerce Committee tomorrow. The ECB's Nouy, Nowoty and Visco are also due to speak at separate events. Not even Forest Gump would be able to outrun these markets at the moment. You really have to have eyes in the back of your head to keep up. Indeed if a few days ago you’d have told me that Russian equities would be down nearly 12% (on some indices) on Monday I probably wouldn’t have expected the S&P 500 to be up +1.88% at their peak of the day. However we then saw a late slump after an FBI raid of Mr Trump’s personal lawyer’s (Michael Cohen) office to close only +0.33% higher. Later on, Bloomberg noted the raids signalled the FBI are conducting a criminal investigation involving Cohen, but its’ target is unclear. Elsewhere, President Trump noted the raids as ‘disgraceful” and “an attack on our country in a sense”. Overall it’s fast becoming a year of divergent trends. As an example there are two significant drivers of credit spreads, one is equity volatility and one is bond volatility. Interesting the VIX remains above 20 but European Government bond volatility is back down towards the rock bottom lows. This actually makes valuing Euro credit tough as on equity vol measures they look expensive (widened too much) but on bond vol measures they look pretty cheap (widened too much). 2018 is not 2017!! Anyway, back to Russia, using the more liquid blue chip MOEX index, equities fell -8.34% - the largest fall since 2014 - when sanctions were imposed after Moscow’s invasion of Crimea. The rouble fell 4.01% - the largest since April 2015. The catalyst was a double whammy of fresh punitive US sanctions announced on Friday, and Mr Trump’s weekend warning that “President Putin, Russia and Iran are responsible for backing Animal Assad. Big price to pay”. This was in response to the alleged chemical attack on Saturday in the last rebel held town in Syria's Eastern Ghouta. Mr Trump also said yesterday that the situation was being assessed and "major decisions" would be made within 48 hours. So this story could have big developments to come soon. Moving onto trade. China’s President Xi seems to have struck a conciliatory tone at the Boao Forum and noted that cold war and zero sum mentalities are “out dated” and “let us dedicate ourselves to openness and win-win outcomes”. He added that China “will enter a new phase of opening up” and will open up sectors such as financial services and auto manufacturing, including “significantly lower the import tariffs for vehicles”. Earlier yesterday, President Trump noted the US will “probably” do a deal with China. He added that it wouldn’t be “nice” of Beijing to target American agriculture in retaliation but “we’ll make it up to (our farmers)”. Elsewhere, Trump said “we are fairly close on NAFTA” while Mexico’s Economy Minister Guajardo noted he sees an 80% chance of an agreement by the first week of May. This morning in Asia, markets are trading higher with the Nikkei (+0.51%), Kospi (+0.06%), Hang Seng (+1.14%), and Shanghai Comp. (+0.51%) all up, while futures on the S&P are also up c1%. Now recapping other markets performance. Similar to the S&P, the Dow (+0.19%) and Nasdaq (+0.51%) also pared back earlier gains to close modestly higher, with the Nasdaq up as much as 2.31% at its peak. In Europe, the Stoxx 600 edged up +0.13% while the DAX (+0.17%) and FTSE (+0.15%) also advanced. Government bonds softened with core 10y bond yields 0.5bp-1bp higher while peripherals slightly outperformed. 10y treasuries reversed a 3.7bp sell off before closing +0.6bp to 2.780% while Bunds were also little changed (+0.8bp). The US dollar index fell -0.30% while both the Euro and Sterling gained c0.3%. In commodities, WTI rose +2.19% to largely reverse Friday’s losses. Precious metals gained c0.5% (Gold +0.25%; Silver +0.68%), while other LME base metals also advanced, in particular aluminium following the US sanctions on the Russian firm Rusal, which produces c7% of the world’s aluminium (copper +0.90%; nickel +1.24%; aluminium +4.75%). Turning to ECB speak on economic growth and inflation. It seems that despite the recent slowing in European PMIs, ECB officials have remained fairly upbeat on economic growth. The ECB’s Draghi noted “we expect the pace of economic expansion to remain strong in 2018” while the ECB’s Praet added “…we have seen a softening of a number of indicators, but they’re still fully in line with the good scenario that we have, so we don’t see reasons to change our assessment of our projections”. Further, the ECB’s Coeure also noted “we don’t have worries about Euro zone growth” because it is simply stabilising after last year’s acceleration, although he has conceded that there is “not enough” inflation. Elsewhere, the ECB’s Constancio told the EU Parliament that adjustments to QE won’t be negative for growth and that “we should be cautious in order to avoid that some early strongly restrictive policies that could derail” the gradual pick-up in inflation. On Brexit, he noted the EU was not “punishing” London’s financial district as “…that was a consequence of the decision the UK took (to leave the EU and the single market), it’s not our doing”. Over in the US, the Fed’s Kaplan noted its’ too early to gauge the economic impacts of the proposed tariffs, which is in line with prior comments by his peers. He also reiterated his base case on rates are 2 more hikes for this year. Elsewhere, the Congressional budget office has released its latest projections for the US budget deficit, which is expected to surpass $1trn by 2020, two years earlier than prior estimates. Nearer term, the deficit is expected to be $804bln in fiscal 2018 (vs. $563bln previous) and $981bln in fiscal 2019 (vs. $689bln previous previous). On a GDP basis, the CBO estimates that federal debt will rise to 96% of GDP by 2028 from 76% of GDP last year, which would be the highest level of indebtedness since 1946 and more than twice the average level recorded over the last half-century. Turning to FX, unnamed sources told Bloomberg yesterday that senior Chinese officials are studying the potential for devaluing the Yuan, with one part of the analysis looking at the effects of using FX as a tool in trade negotiations with the US, while the second part looks at devaluing the Yuan to offset the drags from a trade deal that limits exports. Markets didn’t seemed to be impacted yesterday with the Yuan ending -0.06% lower, although it did weakened as much as -0.23% during the day. Staying with the FX theme, yesterday Robin Winkler and the FX Strategy team published a report called “America First = Dollar last: a new global order under Trump”. In the note the team argue that the Trump administration faces two irreconcilable objectives: it cannot achieve lower US trade surpluses while cheaply funding a large fiscal stimulus at the same time. The team argue that these conflicting objectives pose the most severe challenge to the international monetary order since the collapse of Bretton Woods in the 1970s, and in their view the only way to resolve them is via a weaker dollar. You can find a link to the report here. Before we take a look at today’s calendar, we wrap up with other data releases from yesterday. The Euro area’s April Sentix investor confidence index continued to decelerate and was at the lowest reading since February last year (19.6 vs. 20.8 expected). Germany’s February trade surplus was also below market at €18.4bln (vs. €20.1bln) as exports fell more than expected at -3.2% mom (vs. 0.4%). Elsewhere, the UK’s March Halifax House price index rose 1.5% mom and on a quarterly basis, growth was above expectations at 2.7% yoy (vs. 2% expected).